Chinle resident Jim Williams speaks to the command staff of the Navajo Nation Police on Saturday during a listening session held at the Chinle Junior High. Williams said drivers speeding through school zones should be educated and said suspected drunk drivers are reckless on U.S. Highway 191 between Burnside, Arizona, and Chinle. 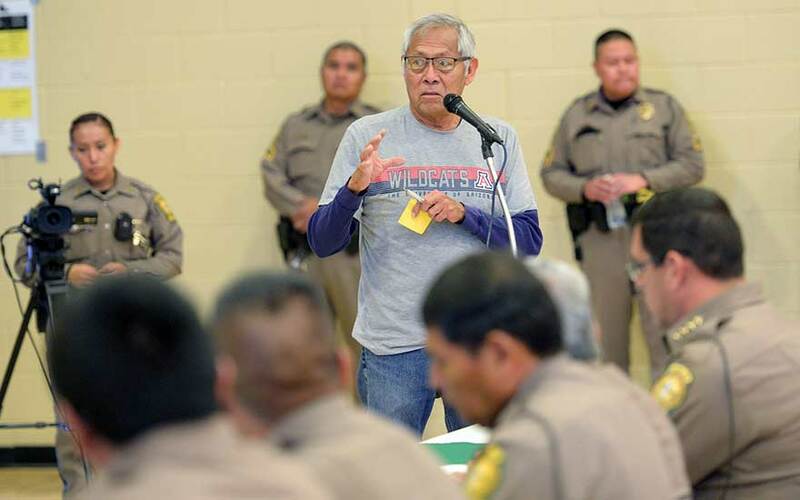 When it comes to the apparent revolving door for alcoholics who end up at the Chinle jail, the police officers’ hands are tied, Navajo Nation Police told an attendee at one of the first in a series of police “listening sessions” held in Chinle last weekend. Francis Teller had asked what the police were going to do about drunk people staggering through the parking lot at the local shopping center. “It’s a real sickening sight,” Teller said. “What happened to the charge of disorderly conduct? Is it still a Navajo Nation law? “Are the judges not doing their jobs?” Teller asked. Capt. Ron Silversmith responded to Teller’s question and said a consent decree was created from the 1992 Silver v. Pahe case that ordered the Department of Corrections to change how it operated and treated inmates. The decree, he said, protects the civil rights of everyone, including intoxicated people.